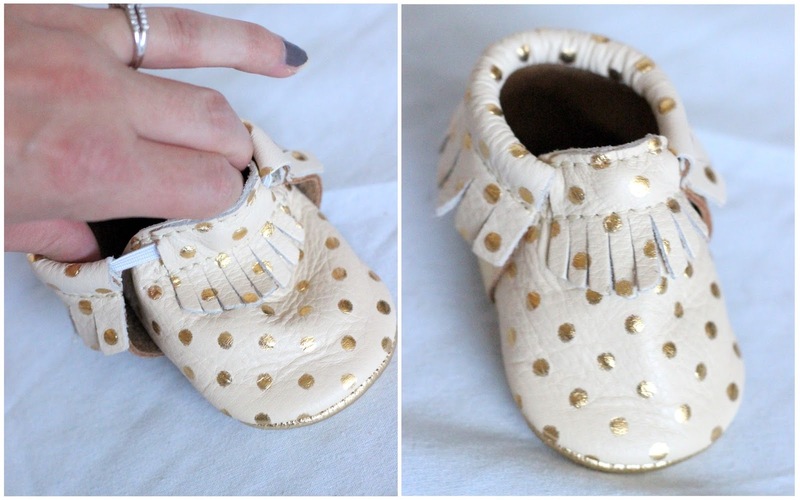 Freshly Picked Moccasins + GIVEAWAY! | For the Joy of Life. 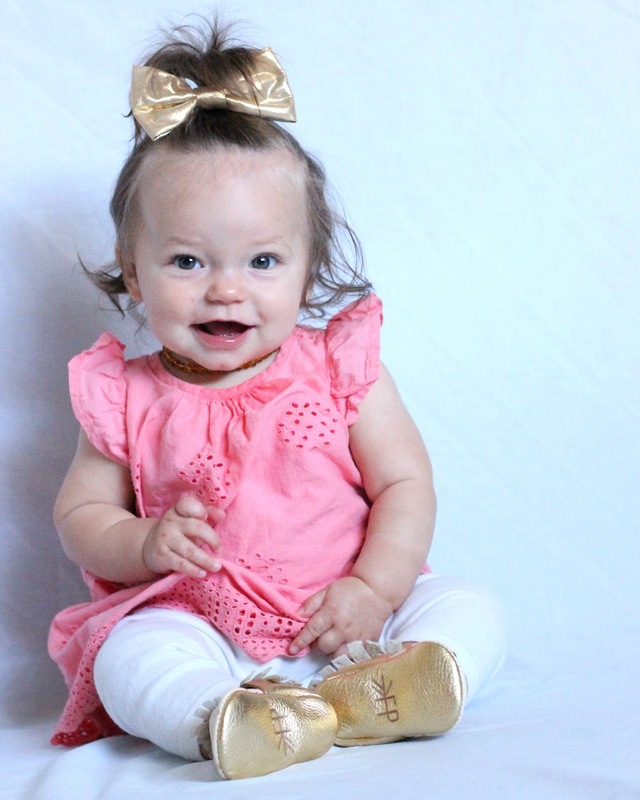 It's no secret that one of the biggest crazes in baby fashion is Freshly Picked Moccasins. I see them everywhere I go! I had to find out for myself what all the hype was about so, Oaklyn got her first pair of teeny tiny Freshly Picked Moccasins! First off, the shipping was incredibly fast and the customer service was amazing. These are two HUGE things that make or break a company for me, so I was very happy with such a pleasant experience! 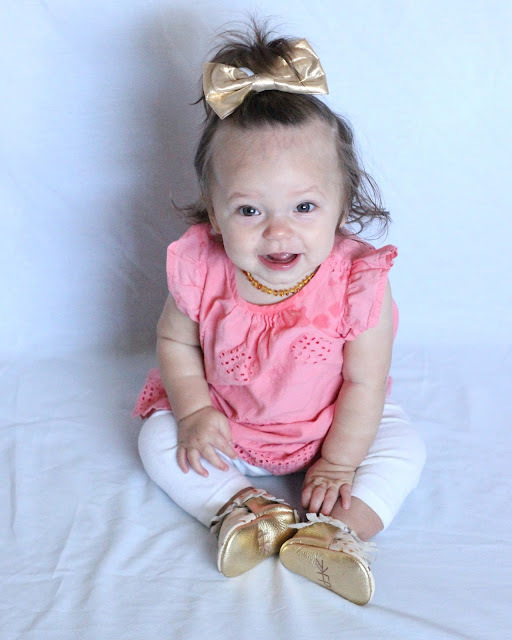 I have tons and tons of baby shoes for Oaklyn that I thought would fit her by now because the tag says 6-12 months. Well, Freshly Picked knew better than to just generalize every baby's foot so they have an awesome and very easy to follow sizing chart on their website. It really made ordering Oaklyn's moccasins a breeze and I wasn't worried at all that they wouldn't fit. There was a HUGE selection of colors to choose from! I had such a hard time picking one pair because they were all so darling! 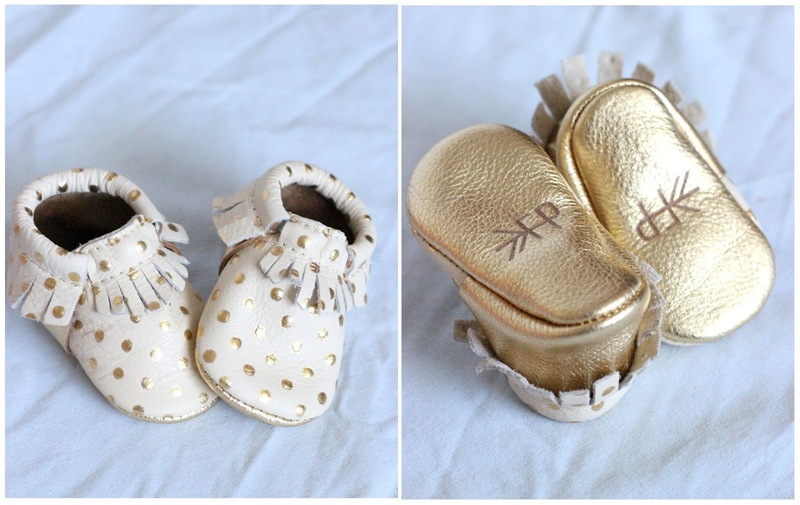 I went back and forth between a few but settled on these perfect ones because what's better than gold polka dots? When they came I was swooning over how adorable they were. I took them out of the bag and exclaimed "I want these in my size!" The gold is stunning and the cream fits so perfect with it. I was actually slightly nervous that I wasn't going to love them as much on than I did just holding them for one reason alone: Oaklyn NEVER keeps shoes on. Ever. Even little ugg boots I have for her. How in the world did she get ugg boots off? 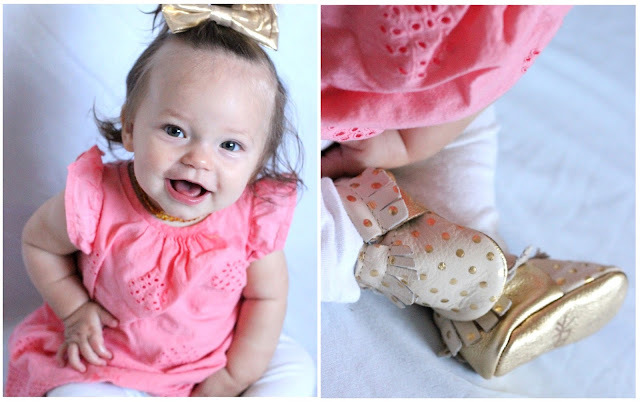 When I started putting the moccasins on her I noticed a stretchy elastic around the top. It was tight enough to keep them on, but loose enough to keep them comfortable on her feet. Needless to say, she kept them on ALL day long and right then I understood what all the "hype" was about! At first Oaklyn started to rub her feet together trying to get them off. She does that with every pair of shoes she owns. Once she noticed they wouldn't come off she started grabbing at them. 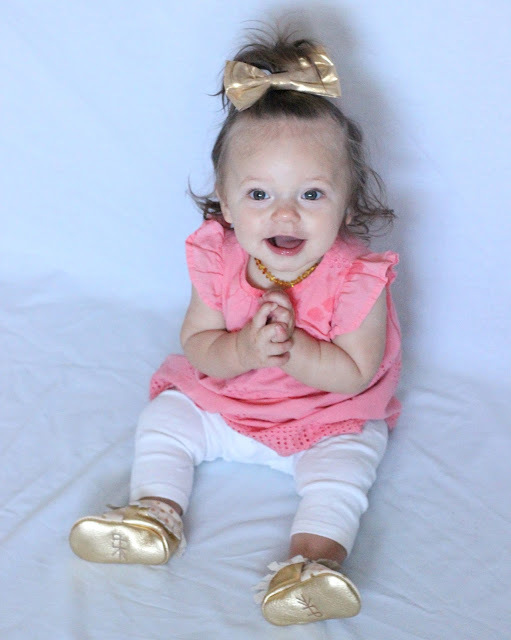 She eventually forgot they were even there and smiled during the whole photoshoot! 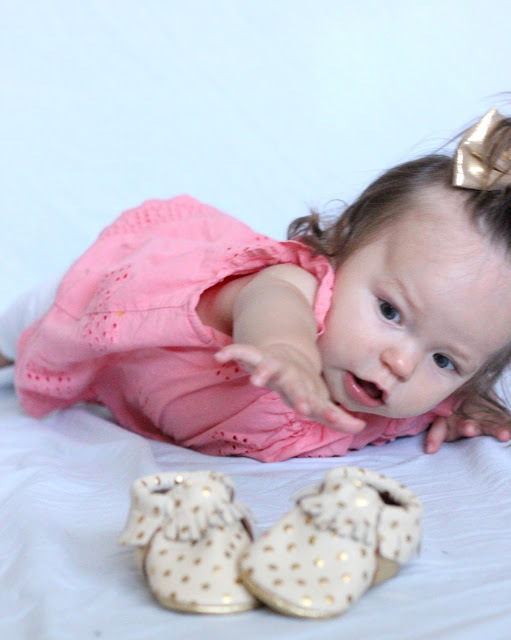 Usually if I put shoes on she's incredibly distracted and pulls at them the whole time during a shoot. When I took them off her feet she was so fascinated by them and wanted them back. I guess she's a fan! Another great thing about these moccasins is that they are totally gender neutral! They have boy and girl colors and styles with seasonal styles as well! Not only that, but they just recently came out with a line of hard sole shoes for the older ones! Overall, I'm very pleased with these moccasins! They're a bit pricey... but well worth it for the quality you are getting. 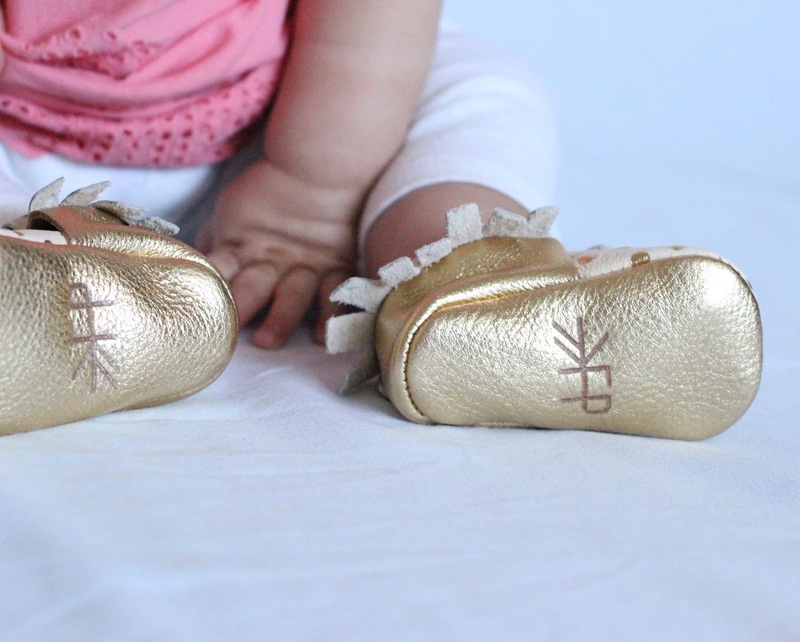 Because Oaklyn and I love her new moccasins and are so pleased with Freshly Picked, we decided our readers need to know what all they hype is about as well! Sooo we're giving away one pair of freshly picked moccasins on my personal Instagram account!! Just head on over and follow all instructions and you're entered!